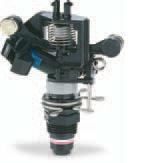 Plastic model which attaches nozzle to riser to irrigate ground cover and shrub areas. Adapts Rain Bird nozzles for use with 1⁄2″ (15/21) MPT threaded risers. Accepts protective, non-clogging 1800 Series filter screen (shipped with nozzle) and PCS Series screens.